Amongst the mountainous list of things to organise for a wedding is transportation. 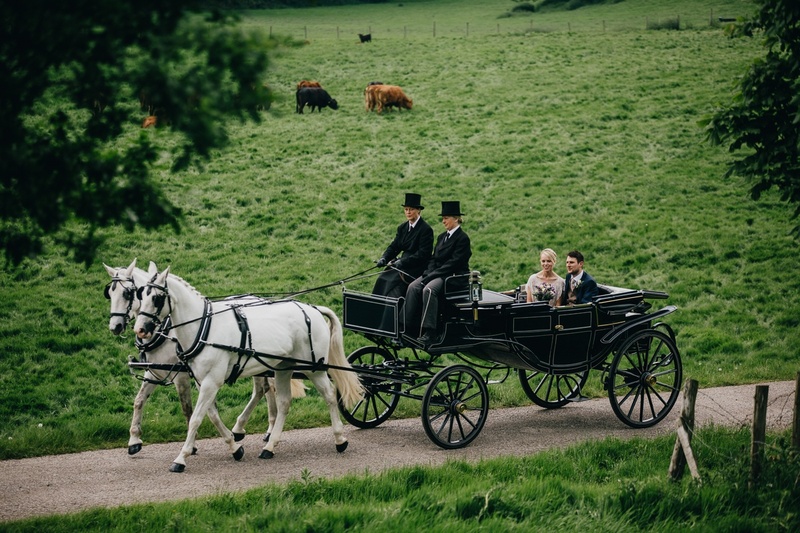 The method of transportation to and from the ceremony venue is one of the most anticipated (and photogenic) parts of the wedding, so you can count on Elegant Carriages to provide a timelessly stylish arrival to your special day. 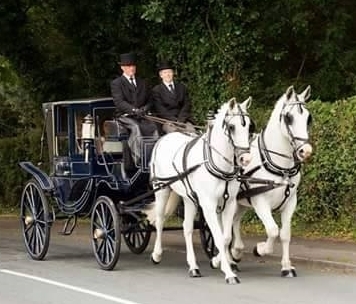 We have a fleet of highly customisable carriages available to hire for your wedding day; whatever colour theme you have chosen for your wedding, you can be sure that our carriages can be decorated to match. 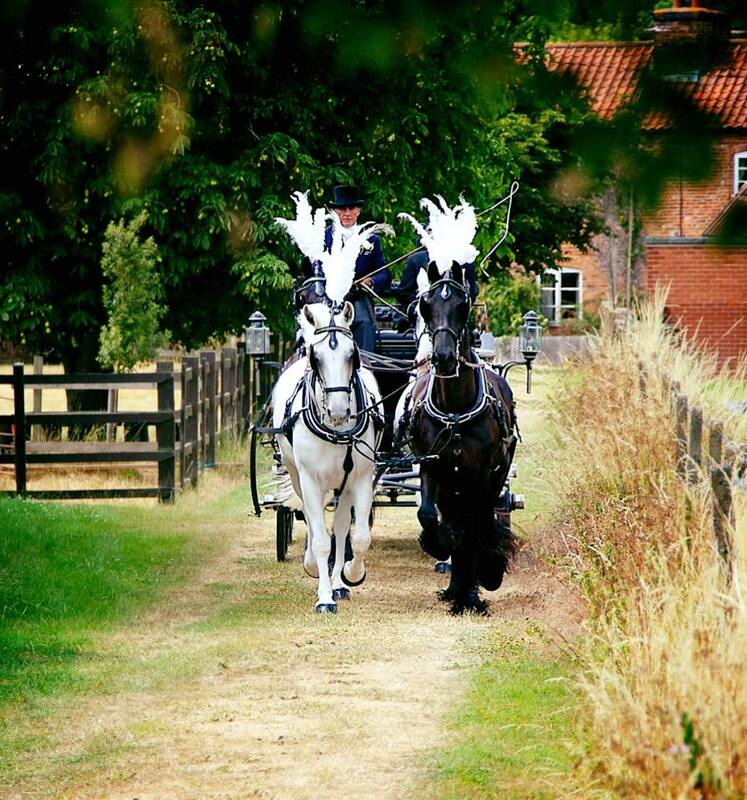 Our two purpose-built Landau are available in Dazzling White or Midnight Black; and are equally attractive whether they are are drawn by a pair or team of our matching or contrasting colour horses. Each carriage is spacious enough to seat up to 5 people- or 2 people and the rest of the wedding dress. The roof of the Landaus can be lowered or raised at a moment's notice to take advantage or shelter from the weather. We additionally have a Navy Blue Victoria Carriage which seats 2 people. Aside from weddings, it's ideal to hire for special occasions such as birthdays, anniversaries or as a romantic surprise. 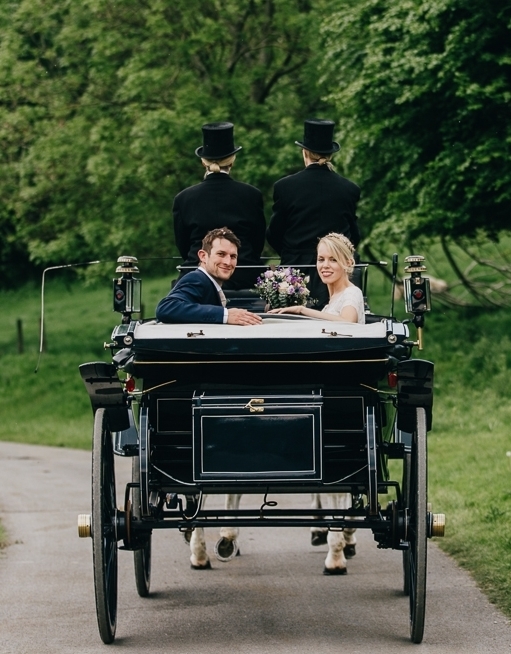 If required, we can provide horse-drawn Cinderella carriages subject to availability. Each of our carriages can be decorated with bridal ribbons and if required, flowers (at an additional cost). We have the North West's largest collection of carriage decorations, including ribbons of all colour imaginable and matching horse plumes. If you'd like to request something more bespoke, we will be more than happy to work with you; simply call us on 08454 379 820 or use the contact form to forward your enquiry. As every wedding is different, we don't like to limit our potential by offering fixed packages. We pride ourselves on providing a bespoke service tailored to our client's every need and requirement. For your big day, no request is too extreme- we can even dress our horses as unicorns for that magical touch on your special day. From our central location in Chorley, Lancashire, we can cover the entirety of the North West, including Lancashire, Cheshire and Merseyside. Though we can travel further if required. How far can the horses travel? Subject to terrain and the circumstances, our horses are able to travel approximately 8 miles. They will be more than happy to wait outside the church during the ceremony and hang around for photographs. If your journey is longer than 8 miles, we can arrange to meet you halfway or offer alternative methods of transport for part of the journey. Please call us to discuss this in detail. We would recommend at least several months in advance for maximum flexibility. Although we can accept bookings under short notice, it is subject to availability and our calendar can fill up fast. Can I meet the horses beforehand? Yes. You can even name which horses you'd like to hire. However, please be aware that there may be substitutions on the actual day due to potential injury or illness. Our office is available to visit by appointment only. Please call us via 08454 379 820 and arrange your appointment. Can I take photos with the horses? Of course you can! 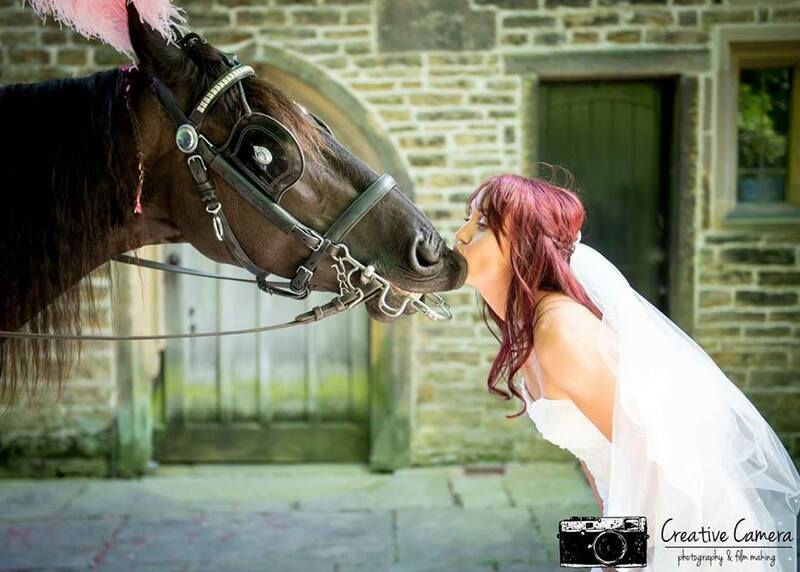 All of our horses are beautifully turned out and highly experienced with weddings. They are extremely gentle natured and fantastic at posing with the camera. Can we provide our own decorations? As long as it doesn't affect the mobility of the operation (ribbons being caught in wheel etc. ), you are more than welcome to provide your own decorations for the carriage of your choice. It's up to you whether we apply the decorations or we can arrange access to the carriage prior to the event.